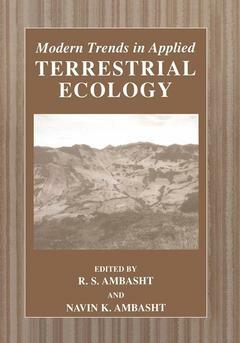 Coordonnateurs : Ambasht R.S., Ambasht Navin K.
This volume brings together some of the foremost leaders in thefield of terrestrial ecology. Chapter topics include soil structureand function, economics of biodiversity, crop growth and development,ethnobotany and conservation. The volume is a must-ready forprofessionals and researchers in the field of botany, zoology,ecology, vegetation science, agriculture, forestry and populationbiology to name a few. This volume brings together some of the foremost leaders in the field of terrestrial ecology. Chapter topics include soil structure and function, economics of biodiversity, crop growth and development, ethnobotany and conservation. The volume is a must-ready for professionals and researchers in the field of botany, zoology, ecology, vegetation science, agriculture, forestry and population biology, to name a few.,Preface. Applied Terrestrial Ecology. The Influences of Compaction on Soil Structure and Soil Function in Forest Sites. An Overview of Ecological Plant Classification Systems: Linking Functional Response and Functional Effect Groups. Ecology of Soil Borne Pathogens in Crop Fields. Economics of Biodiversity. Effects of Air Pollution on Crops in Developing Countries. Applied Ecology of Biodiversity. Restoration and Management of Degraded Tropical Forest Landscapes. Nutrient Export in Tropical Rain Forests. Ozone Stress Impacts on Plant Life. The effects of UV-B radiation on crop growth and development. Vegetation Ecology and Regeneration of Tropical Mountain Forests. Influence of elevated levels of CO2 on Plants. Plant Cover Ecological Implications and Methodical Approaches. Ecology of Individuals: Individual based Models of Single Population Dynamics. Concepts and Application of Non linear Complex Systems Theory to Ecological Succession. Soil Organisms and Litter Decomposition. Applied Ecology of Succession in Pine Forests of Western Japan. Ethanobotany and Biodiversity Conservation. Index.